The wedding day is like a Dream day for every girl and it is a very important day in the life of a person. It is the declaration day for a lifetime commitment to the person you choose to spend the entire life with each other. Who's not excited to wear a dress on this special day? Of course, brides are excited to look beautiful, unique and charming! The wedding dress is not just a dress but it makes an icon for others and photographs of that event are memorable for rest of the life. So it's very important to choose perfect wedding outfit along with jewelry. Picking the correct wedding outfit makes you feel good and wonderful that gives you certainty confidence. Our beautiful selection of designer wedding lehengas & wedding saris will make a bride look staggering on her exceptional day. Take a look on following bridal wear and choose the best for the special day. 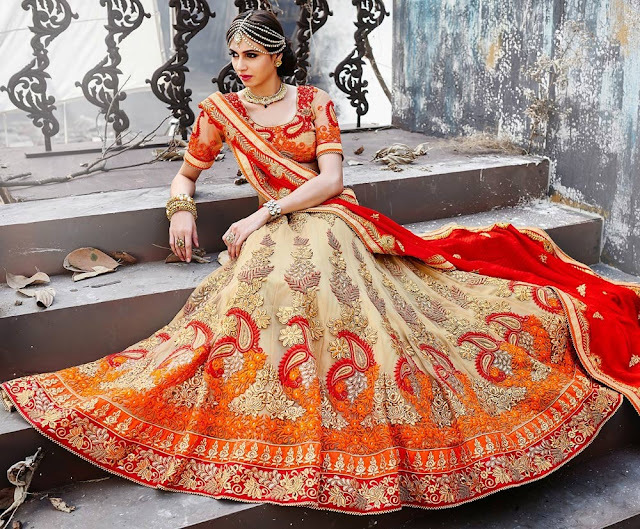 Usually, bride choice the lehengas as it is perfect fits to any kind of bride gives comfort and magnificent look on the occasion. 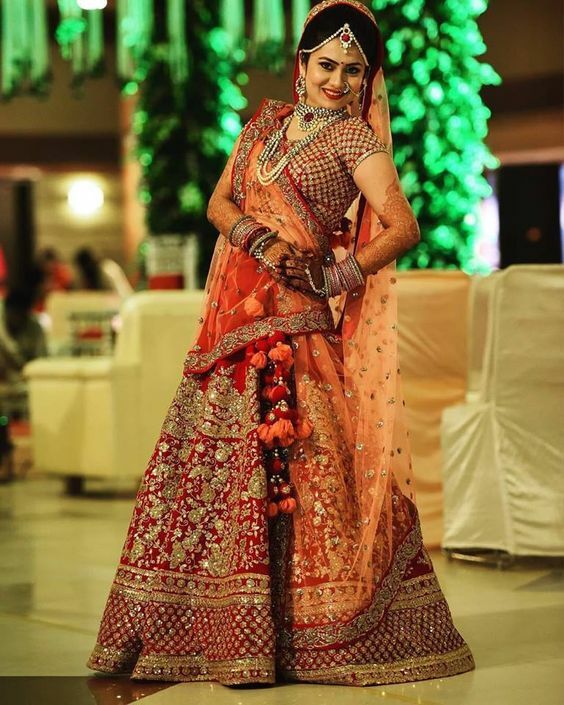 Some of the brides are requested the tailor to make lehengas from the wedding saree for the comfortability. The bride should pick the outfit with consideration and brief details like designs, colors, shades, styles & trends, work etc.. as it's a special day where the bride would be "center of attraction". Select the Wedding outfit in such way that to capture the bride's beauty. Draping style of dupatta is very important as this is one of the tricks to look unique. 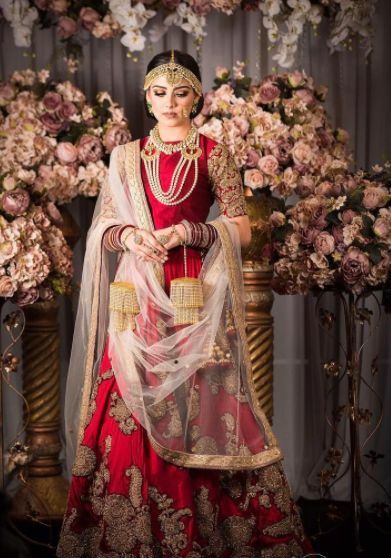 You can decide the style of draping before you go for purchasing the lehenga that will help you to be styled in a unique way. 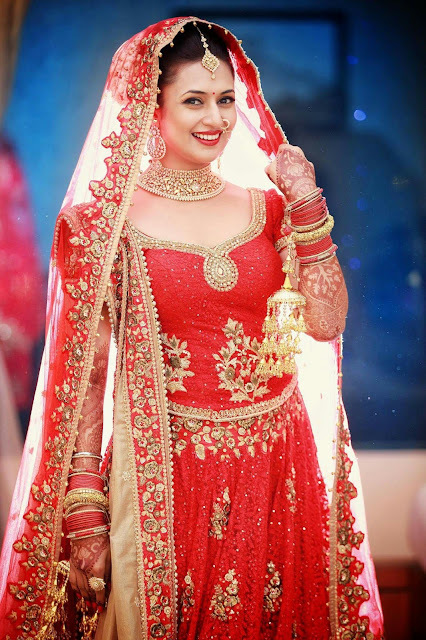 Nowadays, double dupatta with lehenga trend is going on. One for the wrapping on the lehenga and another for covering the head for that you can purchase mismatched or contrast dupatta which will definitely give you unique and elegant look. If you're looking for heavy and sober type lehenga both at the same time, you can select a simple long heavy worked sleeved blouse with heavy lehenga, and dupatta. Bright color with jewelry adds the value in it that gives the rich and charming look. There was a time when brides use red and white color for lehenga or saree but these days, designer design the bridal wear with other bright colors also. If you want to go in a traditional way, select the beige/cream shade lehenga, blouse with embroidery work & red dupatta. By along these lines, customary look and mold both will be kept up. The fashion designers are coming with numbers of designs with innovation but it is advisable not to follow blindly. As a few dresses are looks marvelous on a few yet it's not reasonable for all so be astute while picking wedding wear and make your own particular style to look rich. You can visit our Indian Ethnic Wear Website to get the latest and designer Bridal Wear Collections. Shop now and get a benefit of the exciting deal with Worldwide Free Shipping.